Steve Perry (Alfo) says, "Here is a pic of Lost Star. She started as a standard ordered by my dealer in 1998. 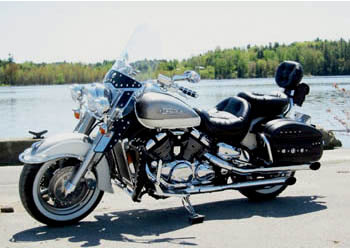 She was lost in a warehouse for two years where Yamaha Canada finally find her in 2000. Imagine how lonely she must have been, dreaming of rides and space. I am doing my best now to make her forget that, she rumbles happily and is the center of attention wherever she goes."